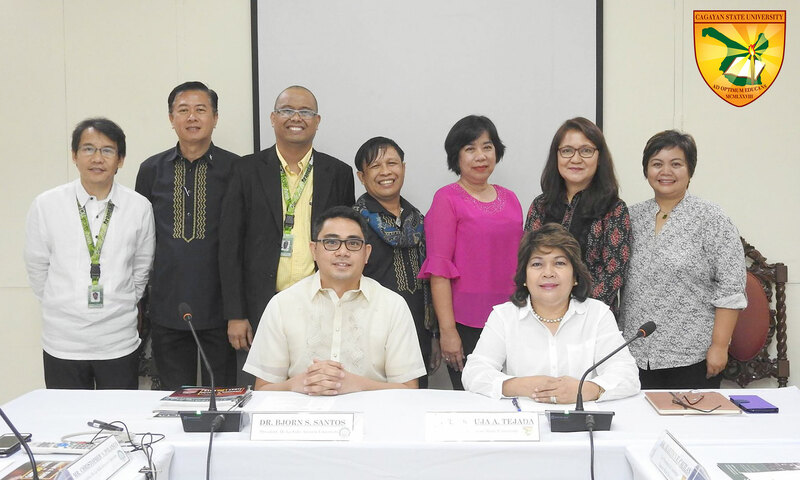 Setting foot in one's Alma Mater usually brings about a nostalgic feeling for an alumna, but for Dr. Urdujah Tejada, going back to her university has brought not only airs of recollection but an opportunity that is mutually beneficial for Cagayan State University and De La Salle Araneta University. On September 20, 2017, President Tejada entered into a Memorandum of Understanding with Dr. Bjorn S. Santos, President of DLSAU expressing interest to explore opportunities related to various academic and research activities. Exchange of professors, scholars, professionals and administrators through mutual visits, exchange of students for study and research, use of facilities and laboratories, collaborative research and extension and on-the-job training are among the activities expected to be undertaken by the two universities soon. A Memorandum of Agreement shall be crafted for specific areas of activities to be embarked on. President Santos of DLSAU thanked Team CSU for taking time and effort to travel despite the distance. This, he said, is proof of CSUâ€™s commitment to the partnership. He mentioned the importance of a passionate service to stakeholders evident in the human resources of DLSAU he is proud of. He further acknowledged the efforts done by President Tejada and Vice President Garan for getting out of their way to make real action happen. On the other hand, President Tejada expressed her trust that, with the strong foundation of DLSAU in academics and research, CSU can find an opportunity to strengthen these aspects at CSU through open communication and mutually beneficial collaborations. She emphasized particularly that the expertise of DLSAU in Agricultural Science can support the Agricultural Engineering and Agriculture programs of the university. The signing, which transpired at De Las Salle Araneta University in Malabon City, was witnessed by Mr. Christpoher N. Polanco, DLSAU Chancellor, Dr. Bernardo N. Sepeda, DLSAU Vice Chancellor for Academics and Research, Dr. Antonio Glinoga, Dean, College of Veterinary Medicine and Agricultural Sciences and Dr. Querobin Dycoco, Jr. , Program Chair of the College of Veterinary Medicine and Agricultural Sciences. From Cagayan State University, Dr. Lina M. Garan, Vice President for Partnership and Resource Mobilization, Magelyn T. Lasam, Executive Assistant to the President and Marie Cabanas-Cauilan, University Information Officer were present.